MOSCOW, January 31. /TASS/. 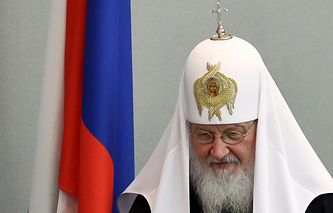 The Russian Orthodox Church builds equal dialogue and shares common goals with the Russian state, Patriarch Kirill of Moscow and All Russia stated on Thursday during a ceremony held at the State Kremlin Palace and timed to the tenth anniversary of his enthronement. "We are offered the opportunity to discuss various issues that concern our people, our society, and, of course, our Church," the patriarch said. "And I would even dare say that for the first time in Russia's history, such a relationship has established itself between the Church and the state. Because even in the times of the Russian Empire, the church did not have an equal partner in the face of the government. It had always been subordinate to certain government institutes," he added. According to the Russian patriarch, today’s dialogue between the church and the state "is a dialogue of individuals and institutions interested in the prosperity of both our Fatherland and our Church." The patriarch thanked Russian President Vladimir Putin, who was present at the ceremony, as well as the Russian government and Russian officials for the successful establishment of dialogue between the church and the state, "held in a friendly and open environment." On February 1, 2009, Patriarch Kirill officially became Patriarch of Moscow and all Rus and Primate of the Orthodox Church. Celebrations in honor of the tenth anniversary of this date will be held in Moscow. Representatives of local Orthodox churches are expected to attend the celebrations, along with members of the Roman Catholic Church, Protestant denominations and Muslim organizations.